The Story Girl stands a little apart from Montgomery’s other novels, which almost all have one girl or young woman at their center (Rainbow Valley is the other exception). 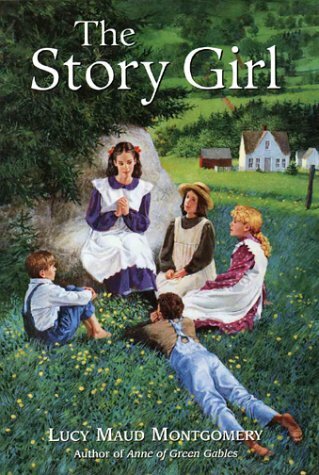 Despite what the title would suggest, The Story Girl has an entire circle of children at its center: brothers Bev and Felix King, Toronto visitors to Prince Edward Island, their cousins Felicity, Dan, and Cecily King, neighbor and faux-relative Sara Ray, hired boy Peter Craig, and cousin Sara Stanley, the titular Story Girl. The group romps through a PEI summer and autumn, brush up against tragedy real or imagined, laugh a lot, and listen to many, many stories from the Story Girl. Up until now, The Story Girl (and its sequel, The Golden Road) were somewhat weak links for me among Montgomery’s novels. I reread many Montgomery novels last year, and there’s a reason this one had not been picked up yet. I never disliked it–but I strongly felt the lack of one central character to attach to. But I found myself liking the book more on this reread. Maybe I’d read it enough to finally feel really acquainted with the ensemble cast who, by the very structure of an ensemble, get less time than a single lead would have. And I also think I attached on this read to the setting, and to the idea of a circle of friends. And then of course, there’s the ongoing fascination of reading the book in light of Montgomery’s life. The book is narrated in first person by Bev King, who is unfortunately the least developed of any of the characters. He and Felix arrive in Prince Edward Island at the beginning of the book, thrilled to come “home” to the place their father grew up in and their family still lives. I wasn’t grabbed by the characters in these first chapters, but I was grabbed by PEI and Montgomery’s love for it. This was the last book she wrote while still living in PEI, and she knew her time there was ending soon as she wrote. You can see it in these first few chapters, in how she describes the boys coming to a place they have never been and yet feels like their true home. She was anticipating her own coming exile and feeling that PEI would always be her truest home–and that proved true in her life that followed. I loved the description of the King orchard, started by Bev’s Grandfather King. He began the orchard when he brought his bride home and they each planted a tree. He and his family continued to plant a tree for every special event in their lives–each birth of a new child, each special visitor, each wedding and so on. The orchard becomes not just an orchard, but a living history of the family for three generations. This was such a beautiful idea. The Story Girl’s stories, surprisingly, did little for me, and I can’t really tell you any reason why. I liked best the ones that tied into the family or their neighbors, and was less enthralled by the myth or folklore ones. I think this points up why the Story Girl herself, though lovely and charming, doesn’t for me have the force of Emily or Anne. She’s told too much through her stories, and the stories, while entertaining enough, just didn’t engage me as much. I did like the adventures of the children more though. I think this was a case of Montgomery drawing somewhat from life and somewhat from what she wished life was. Montgomery had a merry group of cousins, of whom Frede was the youngest, who seem obvious sources of inspiration for the group we see here. She also wrote in her journal about times of feeling intense loneliness as a child, highly sensitive and often misunderstood by the people around her. As an adult woman, she was also experiencing intense isolation during the period in which she wrote the book. So it makes a lot of sense, on a wish fulfillment level, that she wrote a story where none of the characters, in whatever trials they go through, ever go through them alone. They’re always together, for fun or for troubles. One story is particularly illustrative. The children see an article reporting that a fringe preacher has predicted the end of the world for the coming Sunday at 2 pm. The children don’t altogether believe it–but it’s there in print. As the time approaches, the children are filled with increasing terror and dread. The adults prove utterly ineffectual, each of them refusing to take the matter seriously but also unable or unwilling to offer meaningful reassurance. Three different fathers are noted as potential sources of comfort but all three are, unsurprisingly, away or unavailable–like Montgomery’s own much idealized father who was away out west during her childhood. Many remarks emphasize the importance to the children that they be together, to face whatever happens. And they are, through the entire ordeal–which of course ends with no doomsday. The part that makes this especially illustrative? According to her journal, all of this happened to Montgomery as a child–the doomsday prediction, the fear, the inability to find someone to provide meaningful reassurance. But Montgomery was alone. And I am fascinated by the way she retells a frightening childhood experience, but gifts her characters with a circle of comrades for support. To circle back to where I started, this is probably the most appropriate book Montgomery could have dedicated to Frede. The full dedication reads, “To my cousin Frederica E. Campbell, in remembrance of old days, old dreams and old laughter.” The book is really about companionship, through good times and bad, and Frede more than anyone gave that to Montgomery. I think that’s rather beautiful. Sounds like a really lovely book – I love the dedication! Having visited Prince Edward Island recently, I can certainly understand the place it had in Montgomery’s heart – and writing. It is beautiful, and unspoiled by the encroachment of modern urbanization even to this day. It has a feel of a small, tight-knit community, which it is.